BBA is the basic platform for someone who is serious about doing a good MBA programme. The full form of BBA is Bachelor in Business Administration lays the basis of your management education. This course is of more importance to students from a non commerce as it brings them on terms with the basics in Business Administration. 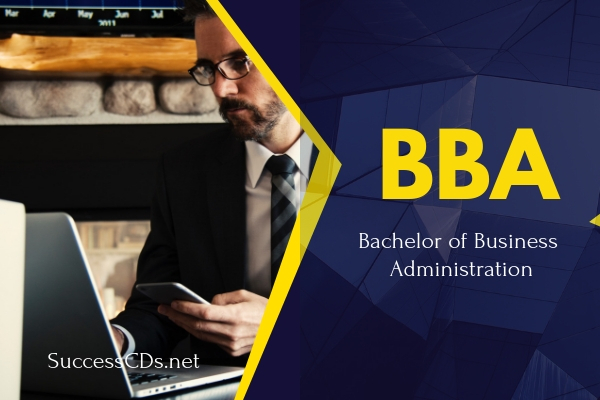 Bachelor’s of Business Administration is a three year degree course. This degree aims at providing fundamental education in business and management principles. The BBA course allows students to specialize in one of the multiple specialization areas, such as international business, finance, real estate, computer information systems, marketing or accounting. BBA programs can offer practical management training that can prepare students to successfully work within a large or small organization. In order to pursue a BBA course, the student must have passed Higher Secondary or equivalent with a minimum of 40 per cent in the qualifying exam and English should be one of the subjects. The BBA in Banking and Insurance programme covers the concepts and fundamentals used in Banking, Financial and Insurance markets. This will enable them to become efficient and up-to-date in banking, financial and insurance planning. It is a three year full-time undergraduate course divided into 6 semesters. This BBA course focuses on the Banking and Insurance sector and its sub-divisions. BBA in Air Travel Management is typically a three year undergraduate course. This course enables the students to understand the functions of organizations. This BBA course mainly covers the subjects such as Finance, Marketing, Human Resources, Accounts, Economics, Business Law etc. students who wish to pursue a career in Airline offices, Travel Agencies, Passenger services, etc can opt for this course. BBA in Computer Applications is a three year full-time undergraduate course divided across six semesters. 10+2 or equivalent qualification from a recognized educational Board is the basic eligibility criteria for pursuing BBA in Computer Applications. After completion of this BBA course, students can opt for a career as Software Developer, System Programmer, Web Designer, Network Analyst, Test Engineer, Technical Support Engineer, Network Administrator, Quality Assurance etc. BBA in Finance is a three year full-time undergraduate course divided across six semesters ( 2 semester per year). This undergraduate course prepares students in making calculative and informed predictions and forecasts about investments and insurance. After completion of BBA Finance course candidates can further opt for Post Graduate course in Finance or Human Resource Management, MBA in Finance etc. These post graduate courses will help them to get better jobs. BBA in Foreign Trade is a three year undergraduate program aimed to develop an understanding of the fundamentals of foreign or international trade. This course enable the students to gain knowledge about how the exchange of goods, capitals and services across the country takes place. In this course students are taught EXIM policy of India, trade procedures,foreign trade policies, multilateral agencies and their role in foreign trade. BBA in Marketing is an undergraduate management course in marketing. The duration of BBA (Marketing) is three years. Eligibility to pursue BBA in Marketing is 10+2 or equivalent exam from a recognized board. Today it is another popular course among the students. The subjects taught in this course are Market research and analysis, Pricing,Product design, Selling and distribution, Promotion, Advertising etc. BBA in Hotel Management is a three year undergraduate program which contains six semesters. It aims to develop skills in the people that is required to manage a hotel, resort, motel or any such similar organization. Those people having interest in the management of a hotel can surely opt for this three years long course. The minimum educational qualification required for a BBA Hotel Management course is 10+2 exam or any other equivalent qualification with a minimum of 45-50% in aggregate. BBA Accounting is a three year undergraduate course with the focus of specialization in the domain of accountancy. Minimum eligibility requirement is the Higher Secondary School Certificate (10+2) examination with commerce subjects such as Accounts, Math and Economics. After completion of the course, successful candidates can get hired in the industries such as Banks, Marketing Organizations, Educational Institutes, Business Consultancies, Multinational Companies, Financial Organizations and Export Companies. A BBA gets you entry-level positions in many corporations and factories. You would do lot of backend work, and provide support services to your seniors. Exceptional candidates could expect to do some customer interface, though it is very rare. Also invariably, you would hit the glass ceiling very fast, and would require an MBA to move up the ladder. Since the degree will equip a student of BBA with the basic knowledge about corporate management and skills it will help them understand the diverse functioning of a company. BBA graduates can look for jobs in sales and marketing department of companies as members of sales teams or as management trainees. After completing a BBA, students should consider broadening their horizon in order to qualify for top executive positions and promotions. A Master of Business Administration (MBA) is a graduate-level degree that is often desired by employers for positions such as CEO or COO. Doctoral programs are also available in business administration, which can prepare business professionals for work as consultants, executives or university professors.